We thought it might be fun to think about the top 10 affordable coins that every decimal collector should have in their collections. When we say affordable, we mean coins that the everyday collector can afford to purchase on a reasonable budget in the space of a few years. There’s no coin in the list that’s worth more than $500 and most of them are under $100. Some of them are available from various sources pretty much all of the time, others you’ll have to take your time finding. Best of all, all of these could still be found in found in change!. As always with these sorts of lists it’s open to debate as to what coins belong on the list, Our list is our opinion and comprises only circulation coins and varieties of circulation coins. There’s no errors or NCLT (non-circulating legal tender) on this list. Here they are (in no particular order). If you’re like us, the 2000 $1/10c Mule (or just the “mule”) will be one of the first truly desirable decimal varieties you will learn about. They were discovered reasonably recently and they are still fresh in the mind of many collectors. What’s more, some of the individuals who helped to identify the “mule” and went on to find many of the higher grade examples that are on the market today are still collecting and active on internet coin forums. Then there’s eBay, the most active of coin markets where there’s always a number of 2000 $1/10c mules up for sale. These range from Fine examples that have just been discovered right up to the gleaming uncirculated examples that were pulled from rolls in Perth in 2003 or from the Burswood Casino. We can all watch the market for these coins and salivate over the prices some of them achieve and wish we had one in our own collections. And thus the 2000 $1/10c mule is on our list of top 10 affordable Australian decimal coins. It’s the most expensive coin in the list with a decently centered Fine to about Very Fine coin costing somewhere between $400 and $500. It’s a coin every decimal collector should own at least once and a coin you can still find in change if you’re lucky. One of two upset coin errors in our list the 2001 Centenary of Federation Upset $1 coin is a popular, and to be honest, easy to purchase decimal variety. They came about when one die run (perhaps 100,000-200,000 coins) of the circulation 2001 Federation Dollar had a loose obverse die. As the die run progressed the obverse die rotated continually producing coin upsets of varying amounts. Collectors specify the degree of upset by using a clock face analogy, so a 90 degree upset is a 3 o’clock upset while a 270 degree upset is a 9 o’clock example. When rolls of these upset coins were released they mainly went to Melbourne where they were found in large numbers by noodlers who tried (and in some cases succeeded) in building a clock face of errors with a coin matching each hour on a 12 hour clock. Because this variety is popular among collectors and large upsets (such as a 6 o’clock upset) are easy for non collectors to see and understand we think this is an important coin to have in a decimal collection. $20-$30 will buy you a circulated example off of eBay. In the year 2000 the Royal Australian Mint released a commemorative 50c coin into circulation to celebrate the new millennium. This coin depicts a large Australian flag and it was a few years after release that it was noted that the Union Jack on some of the 50c coins was slightly different to most others. The Cross of St George (formed by the horizontal and vertical lines) and the Cross of St Andrews (formed by the diagonal lines) of the Union Jack are incuse on the much scarcer variety. On the normal variety these crosses are in relief. Close examination of the stars of the Southern Cross on the Australian flag also show some differences, with the fields of the stars on the normal variety being quite rough while the “incuse 50c” has smooth star fields. The Incuse 50c is extremely well known in decimal collecting circles and can still be found by noodling 50c coins, in fact one the authors of this article has received one in change! It is generally assumed that just 100,000-200,000 of the Incuse 50c coins were made and it’s because of the low mintage and the reputation of the variety that we’ve included in the top 10 Australian decimal coins. Expect to pay $20-$50 for a well circulated example or up to $100 for an EF coin. The 5c coin is one that holds little interest to most collectors, but there is one year that collectors look to find in choice uncirculated condition and noodlers still look for in change. The 1972 5c was the lowest circulation mintage year of all 5c coins with just 8.3 million coins minted and another 28,580 coins destined for a slow, PVC assisted death in the red 1972 mint set folder. Because of the low mintage and the ruined mint set coins the 1972 5c used to be a little difficult to find in better condition. However, with the advent of third party graded coins in the Australian market some dealers have recognised the relative scarcity of the coin and have sought out rolls and now they can now be had in top condition in a PCGS slab for not too much at all. Expect to pay $50 or so for a PCGS MS65 or MS66 example. They come up from time to time on eBay and represent good buying for the only 5c coin to make our top 10 list. This 50c variety is the most recently minted coin on our list. Some 2010 50c coins were minted with either the obverse or reverse dies misaligned by 30 degrees resulting in a coin that is upset by the same amount. While we can’t be sure of the exact way this error came about nor the mintage we can say that they are scarce. A few have appeared on eBay in the last year and noodlers who are looking for them in bulk lots of 50c coins from banks are having a tough time finding any more. Perhaps it’s too early to say but this variety could easily become more desirable than the year 2000 incuse 50c coin and that’s why we’ve put it on our list. Expect to pay $50-$100 for one of these coins – if you can find one! The 80% silver 1966 50c was the last circulating Australian coin containing silver. It holds a special place in the heart of not just coin collectors, but a significant part of the Australian public. Every coin collector has experienced that moment when they show a round 50c to someone who exclaims “I remember those, they are really rare and valuable!”. Of course, they are not rare, and they are really only worth what the 1/3 of an ounce of silver that they contain is valued at. But the round 50c isn’t in this list because it’s rare or valuable. 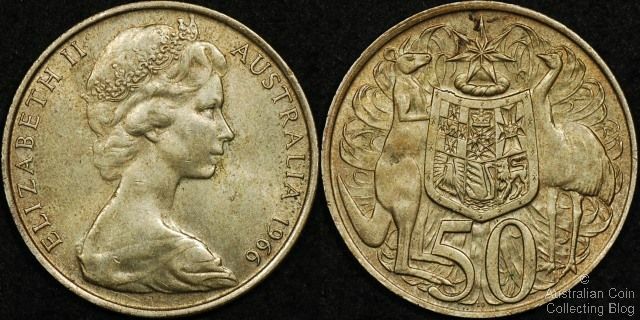 It’s here because it’s arguably the most well known Australian decimal coin of any type and it takes many people back to the time of decimal changeover when hoarding round 50c coins became something of a national pastime. Look to spend not much more than bullion on a round 50c, or about $10 at time of writing. If you want a nice brilliant uncirculated coin you might pay up to $20. The 1966 Wavy Baseline 20c or “wavy 20” as it is affectionately known among coin collectors is probably the most romantic decimal variety available today. This is for a couple of reasons. Firstly, long-time collectors have stories of half rolls of wavy baseline 20c coins being found in the 1960’s and being hoarded away by astute collectors. Secondly, new collectors can still find Wavy 20c coins in circulation if they look long and hard enough. There are many threads on coin forums about new collectors noodling through thousands of 20c coins they’ve withdrawn from the bank before they finally find one of the elusive coins. Sure, it’s banged up with 47 years of circulation but they found it and it’s theirs! So we’re adding a heavily circulated wavy baseline 1966 20c to our list which might set you back $200 on the open market. Or just 20c if you look hard enough. The 1968 2c coin in red uncirculated condition doesn’t appear to be a tough coin at first glance. It has a mintage of nearly 17 million coins which actually exceeds the 1969 mintage and far exceeds the mintages of mint-set only 2c years such as 1986 and 1987. However, there were no mint sets issued in 1968 so unlike other years all the coins minted to a circulation standard actually went into circulation rather than some being preserved in top condition in mint sets. Secondly, the legend is that the Royal Mint in Perth wrapped the 1968 rolls of 2c coins in a different type of paper to 1966 and 1967 2c coins. A type of paper that happened to be quite acidic which over the medium to long term badly affected the coins they wrapped. So, a reasonably low mintage, the lack of mint sets, and the acidic roll wrapping paper have all combined to make the full red uncirculated 1968 2c coin a hard one to find. Be prepared to spend $75+ on a nicer full red example. If you’re looking for a PCGS graded example aim for at least a PCGS MS64RD which might set you back $100. The “No SD” or “missing SD” 2c of 1967, 1968, or 1981 is an important decimal variety that should be present in every decimal collection. Occurring in three separate years (and the possibility of others still to be confirmed) it is still a coin that dedicated searchers can find in bulk lots of circulated 2c. In the last year or so some dealers have been going out of their way to get the 1967 and 1968 No SD 2c in nice red uncirculated condition graded by PCGS. These coins are fetching top prices well outside the budget of this list. However, for our purposes we believe you can get a perfectly nice EF to AU 1981 No SD 2c for just $20 to $30. A well circulated 1967 or 1968 No SD 2c is probably going to set you back $10-$20. Whichever coin you choose to get it’ll be a great part of your collection. An interesting variety that a lot of decimal collectors try to find is the “double bar 50c”. The double bars are two horizontal bars which appear in the reeds of Mitchell Grass on the reverse design behind the emu’s head on the regular circulation 50c. They were part of the design on the transfer punches that produced the dies for the 50c piece but were ground off of some dies as it was thought they produced die weakness. As a result some 1979 and 1980 50c coins can be found with prominent bars and other years show traces of them. These can be picked up for under $10 and are an interesting variety in the design that’s remained in circulation since decimal introduction in 1966. That concludes the list, honourable mentions to the 1981 3 1/2 claw 20c, the 1971 20c, the 1973 Perth Mint 2c, the 2004 Large Head 20c, and the 1966 Perth Mint 1c. As we said earlier this list is just our opinion, if you’ve got different ideas then we’d love to hear about it.